To call Amos Davis a rolling stone would be an understatement. In his prime, he had women falling at his feet, three in particular. First there was Linda, the woman he came closest to loving until Melba Jean came along. Trying to love Melba Jean was a battle Amos wasn’t willing to engage in, so it was easy to move on to Ruby. Such is the life of a musician, but Amos didn’t just leave those women behind, he also left behind three daughters scarred with memories of a fleeting father. Now that he's losing his memory, he wants a chance to reconcile with the adult daughters he rarely had time for as children. Present day Amos is suffering from Alzheimer’s. In his mind, he’s fully capable of taking care of himself instead of sitting up in a nursing home. In that same mind he’s still on the road playing piano. Through flash backs readers watch as he shifts between the past and the present, telling the story of how his relationships have played out with his daughters. Most interesting is the correlation between how much he loved their mothers and how he treats each daughter as a result. It’s for this reason that it seems that he loves Cass, Linda’s daughter, most and seems to overlook Toya, Melba Jean’s daughter. Cass has always believed that she wasn’t affected by Amos’ departure from her life, especially since he wasn’t really her father, just her stepfather, but she would be wrong. Even though she shared a close relationship with Amos as a child, she watched him leave her mother for other women, a temporary fixture in their lives, and sought men much like him. Toya would roll her eyes if you told her she only dated married men because of her daddy issues. But as a child, she watched Melba Jean steal Amos from Linda and in return attack other women and fight for Amos’ love. Adult Toya is a present day version of Melba Jean, right down to the angry wives that confront her about their men, and a bitterness that takes over her whenever she thinks of the father that abandoned her. Tomiko got Amos’ sense of creativity and has turned it into a career as a highly acclaimed children’s author. She doesn’t seem to have any of Toya’s bitterness or Cass’ self-esteem issues, likely because she had a mother that didn’t dwell in the past. Though we don’t know a lot about Cass’ mother post-Amos, we know that Tomiko’s mother got married and had two more children, which seems to have served Tomiko well and makes her the daughter most readily to accept Amos’ apologies. 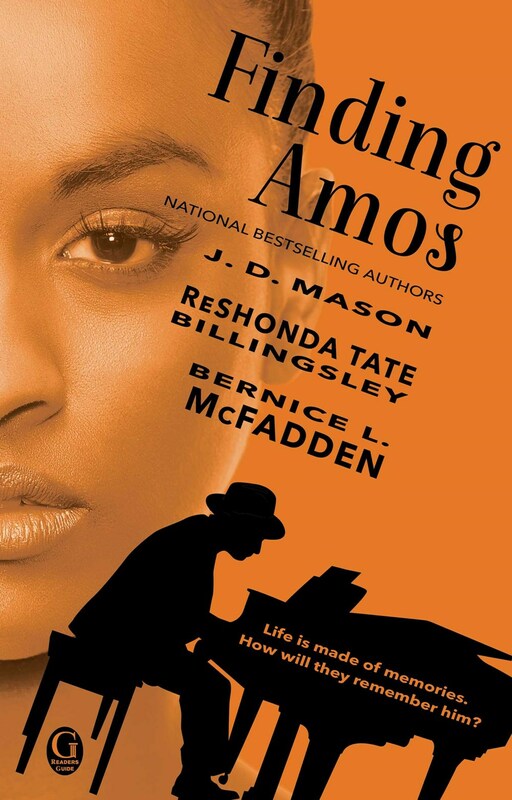 Finding Amos was originally scheduled for release under the title Amos back in December of 2012, but was tabled for some reason. I remember reading it then and thinking it felt disjointed. It read in three distinct voices of three authors that seemed to have not shared chapters with each other and the writing styles were so different that it was easy to determine which author had taken on each daughter. This version flows much better and makes a much more compelling read. Disclaimer: Copy of book received from publisher, opinions are my own.